At 5:29:45 a.m., July 16, 1945, a blinding flash and unbelievable heat seared the New Mexico desert—the world's first nuclear explosion. 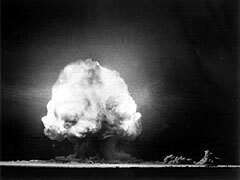 Code-named Trinity, the Manhattan Project's test of the plutonium implosion bomb was a stunning success. The explosion almost equaled 20,000 tons of TNT, many times what some had expected. General Groves and his Project leaders were jubilant and relieved. But for some, the spectacle also cast an ominous shadow. Los Alamos scientific director Dr. Robert Oppenheimer later said he thought of the lines from the Hindu scripture, the Bhagavad Gita, I am become Death, Destroyer of Worlds.